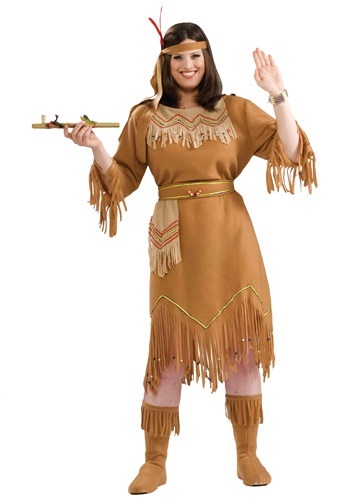 This women's Native American costume is an authentic and fun costume for Halloween! 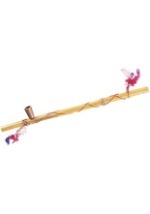 It features a pair of brown boot covers that have fringe on the top and are secured to your shoe with elastic. A brown headband ties in the hair and accents the brown, polyester dress that has fringes along the sleeves and bottom. The top of the dress is decorated with a light brown neck piece that features a beautiful Native American pattern in red, blue and yellow ribbon and fringes along the bottom. 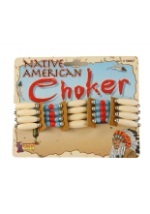 These fringes, along with the fringes on the dress' bottom, are embellished with beads in a variety of colors. A matching belt velcros around the waist and has an attached sash. 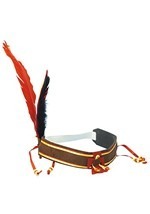 The sash also features a Native American pattern created with ribbon and fringes. 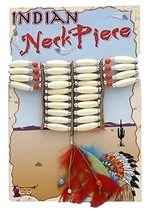 Slide on any of our Native American wigs or headdresses for a complete look.